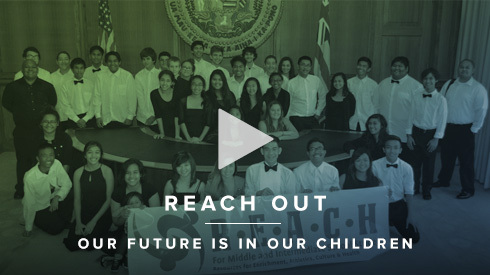 To provide Resources for Enrichment, Athletics, Culture and Health for Hawai'i intermediate school students through non-instructional hours programs that improve student outcomes and keeps them on track and engaged. R.E.A.C.H. programs are high quality youth development activities and after-school programs focused on education and academic enrichment, arts and culture, active healthy living and athletics. After-school programs excite children about learning. Since the initiative was launched in 2014, 39 schools and over 5,000 students have benefited from the R.E.A.C.H. Initiative. Over $2.2 million appropriated for Hawaii public middle/intermediate schools. Provide support for school students’ education, health & well-being. Provide opportunities to participate in before or after-school programs. Provide health, fitness, educational & social enrichment opportunities. Help reverse the high school dropout crisis by stopping disconnection. Prepare students for high school, college, the workforce, and beyond.